This is a group for all kinds of Hot Rod wallpapers. Hot Rods are typically American cars with large engines modified for linear speed.There is still a vibrant hot rod culture worldwide, especially in Canada, the United States, the United Kingdom, Australia and Sweden. They are not actual antiques, but often are superior in some aspects such as build quality to original equipment bodies. The term seems first to have appeared in the late 1930s in southern California, where people raced modified cars on dry lake beds northeast of Los Angeles under the rules of the Southern California Timing Association (SCTA), among other groups. The activity increased in popularity after World War II, particularly in California, because many returning soldiers received technical training in the service. Many cars were prepared by bootleggers in response to Prohibition to enable them to avoid revenue agents ("Revenooers"); some police vehicles were also modified in response. The first hot rods were old cars (most often Fords, typically Model Ts, 1928–31 Model As, or 1932-34 Model Bs), modified to reduce weight. Typical modifications were removal of convertible tops, hoods, bumpers, windshields, and/or fenders; channelingthe body; and modifying the engine by tuning and/or replacing with a more powerful type. Speedster was a common name for the modified car. Wheels and tires were changed for improved traction and handling. "Hot rod" was sometimes a term used in the 1950s as a derogatory term for any car that did not fit into the mainstream. Hot rodders' modifications were considered to improve the appearance as well, leading to show cars in the 1960s replicating these same modifications along with a distinctive paint job. Typical of builds from before World War Two were '35 Ford wire-spoke wheels. Immediately postwar, most rods would change from mechanical to hydraulic ("juice") brakes and from bulb to sealed-beam headlights. Engine swaps often involved fitting the Ford flathead V8 engine, or "flatty", in a different chassis; the "60 horse" in a Jeep was a popular choice in the '40s. After the appearance of the 255 cu in (4.2 l) V8, because of interchangeability, installing the longer-stroke Mercury crank in the 239 was a popular upgrade among hot rodders, much as the 400 cu in (6.6 l) crank in small-blocks would later become. In the 1950s, the flathead block was often fitted with crankshafts of up to 4.125 in (104.8 mm) stroke, sometimes more. In addition, rodders in the 1950s routinely bored them out by 0.1875 in (4.76 mm) (to 3.375 in (85.7 mm)); due to the tendency of blocks to crack as a result of overheating, a perennial problem, this is no longer recommended. In the '50s and '60s, the flatty was supplanted by the early hemi. By the 1970s, the small-block Chevy was the most common option, and since the '80s, the 350 cu in (5.7 l) Chevy has been almost ubiquitous. After World War II there were many small military airports throughout the country that were either abandoned or rarely used that allowed hot rodders across the country to race on marked courses. Originally drag racing had tracks as long as one mile (1.6 km) or more, and included up to four lanes of racing simultaneously. As hot rodding became more popular in the 1950s, magazines and associations catering to hot rodders were started. 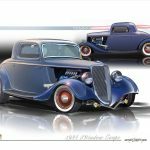 These were led by Hot Rod Magazine" which is the oldest magazine devoted to Hot Rodding started in January 1948. As some hot rodders also raced on the street, a need arose for an organization to promote safety, and to provide venues for safe racing. Hot rodders including Wally Parks created the National Hot Rod Association (NHRA) to bring racing off the streets and onto the tracks. They created rules based on safety and entertainment, and allowed Hot Rodders of any caliber the ability to race. The annual California Hot Rod Reunion and National Hot Rod Reunion are held to honor pioneers in the sport. The Wally Parks NHRA Motorsports Museum houses the roots of hot rodding. The mid-1950s and early 1960s custom Deuce was typically fenderless and steeply chopped, and almost all Ford (or Mercury, with the 239 cu in (3,920 cc) flatty, introduced in 1939); a Halibrand quick-change rearend was also typical, and an Edelbrockintake manifold or Harman and Collins magneto would not be uncommon. Reproduction spindles, brake drums, and backing based on the 1937s remain available today. Aftermarket flatty heads were available from Barney Navarro, Vic Edelbrock, and Offenhauser. The first intake manifold Edelbrock sold was a "slingshot" design for the flatty. Front suspension hairpins were adapted from sprint cars, such as the Kurtis Krafts. The first Jimmy supercharger on a V8 may have been by Navarro in 1950. As automobiles offered by the major automakers began increasing performance, the lure of hot rods began to wane. It was no longer necessary to put a Cadillac engine in a Ford roadster to be fast. It was now possible to buy a muscle car that outperformed nearly any hot rod, with more passenger room, and without having to expend the effort of building and tuning the car oneself. After the 1973 Oil Crisis, the public called on automakers to offer safety and fuel efficiency over performance. The resulting decrease in an average car's performance led to a resurgence of hot rodding, although the focus was on driving hot rods over racing so the term 'street rod' was coined to denote a vehicle manufactured prior to 1949, often with a more reliable late model drive train. Street rodding as it was now known was a different phenomenon than hot rodding, as street rodding was mainly family-oriented. National events were hosted by the National Street Rod Association (NSRA), which also stressed safety as the NHRA did 20 years before. Each NSRA event has a 'Safety Inspection Team' that performs a 23-point inspection process beyond normal State Safety Inspections. Page rendered with 6 queries (and 0 cached) in 0.055 seconds from server 48.